What is Copernic Search Server? Copernic Search Server is a robust enterprise search engine that runs on a Windows server or PC. 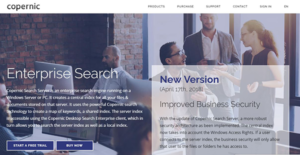 It’s an innovative site search solution the leverages the Copernic search technology to create a unified index for all files and documents stored on an organization’s server. The platform allows employees to search within the organization network to find business content including files, documents, images, PDF, or emails archived on the shared server. The system creates a map of all keywords as a shared index that can be accessed using Copernic Desktop Search Enterprise client which is designed to help you search both the server and local indices. Copernic Search Server searches and aggregates information on a company server the same way search engines such as Google index the internet. Some of its salient features include indexing, multiple file types, search everywhere, refine fields, contextual menus, and search operators. Copernic Search Server is a powerful enterprise search solution that helps you find the information you need quickly and more efficiently. The system indexes an unlimited number of email messages, files, and documents on you organization server and allows multiple users to find what they need with ease. Its free version offers support for more than 119 files types whereas the full version lets you index and search over 150 files types including Outlook, Microsoft, PDF, Cloud Services, Microsoft Office, and many more. The platform is renowned for its robust security architecture. The solution brings improved business security with a central index that takes into account all Windows Access Rights. If an employee connects to your organization’s server index, Copernic business security will only permit them to see the files or folders they have access to. It automatically replicates the default access rights you have implemented and enforce authorized groups, computers, and users to view information in your server index. Additionally, the software leverages the power of Copernic Desktop Search to allow you to search everywhere across every network or drive on your system. It builds the index right on the first use and then updates it in the background to create a comprehensive index stored on the server. Better still, its architecture makes it easy for each user to devise a local index of personal data. You will also be impressed by the offline mode which permits you to use Copernic Search Server on networks that have no internet connections. It enables your team to work in a closed environment with no internet connection to the outside world. If you are considering Copernic Search Server it might also be beneficial to examine other subcategories of Best Site Search Solutions collected in our base of B2B software reviews. Each enterprise has different requirements and needs an application that can be customized for their size, type of workers and buyers, and the specific industry they are in. For these reasons, no system can proffer perfect features off-the-shelf. When you look for a software system, first be sure what you want it for. Read some Copernic Search Server reviews and ask yourself do you desire basic features or do you need advanced features? Are there any industry-specific features that you are seeking? Find the answers to these queries to aid your search. There are lots of elements that you need to consider and these include your finances, particular business needs, your organization size, integration needs etc. Take your time, use a few free trials, and finally select the platform that presents all that you need to improve your organization efficiency and productivity. How Much Does Copernic Search Server Cost? We realize that when you make a decision to buy Site Search Solutions it’s important not only to see how experts evaluate it in their reviews, but also to find out if the real people and companies that buy it are actually satisfied with the product. That’s why we’ve created our behavior-based Customer Satisfaction Algorithm™ that gathers customer reviews, comments and Copernic Search Server reviews across a wide range of social media sites. The data is then presented in an easy to digest form showing how many people had positive and negative experience with Copernic Search Server. With that information at hand you should be equipped to make an informed buying decision that you won’t regret. What are Copernic Search Server pricing details? What integrations are available for Copernic Search Server? If you need more information about Copernic Search Server or you simply have a question let us know what you need and we’ll forward your request directly to the vendor.